It has been a long journey towards healthful eating and one that I am very proud of. Nowadays I choose organic and non-GMO products 90% of the time over other similar products that are not organic or non-GMO. I care a lot about what I put into my body. And I rarely choose faux meats and cheeses. But, it wasn't always this way. As a vegetarian teenager, I had my share of fast-food fries and greasy pizzas. And as I was making the transition to veganism, faux meats and cheeses were like comfort foods. So, in an effort to seem a little more real, I have to admit that every once in a while, I put all of my healthful eating habits aside and eat non-organic frozen pizza. There -- that felt like a dirty little secret and now that it is out, I already feel better. My willpower really broke when I saw Daiya's new frozen pizzas including a new supreme pizza at Expo West. I tried to walk by and just look at them, but curiosity killed the cat, as they say, and I had to try them. And I loved them. So, it made me realize that I avoid eating that kind of food regularly, but every once in a while, it probably won't kill me. 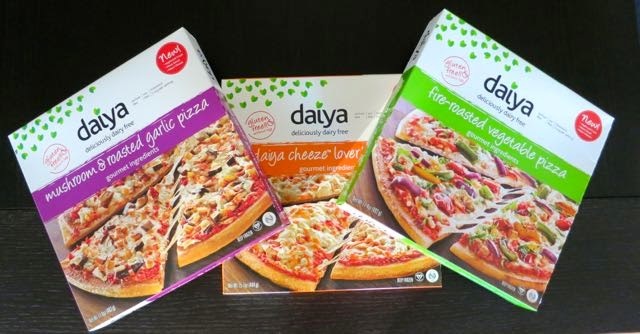 So, I went back home and tried the three Daiya pizzas that have been out in the stores forever. My favorite was the Fire-Roasted Vegetable pizza. 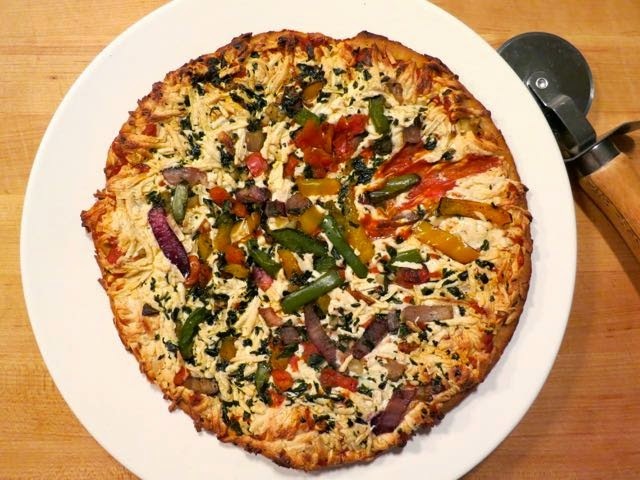 Atop a typical frozen pizza-tasting crust made of non-typical gluten-free ingredients was a tomato basil sauce, Daiya mozzarella shreds and roasted red onion, green bell pepper, yellow bell pepper, tomatoes, garlic, and basil. 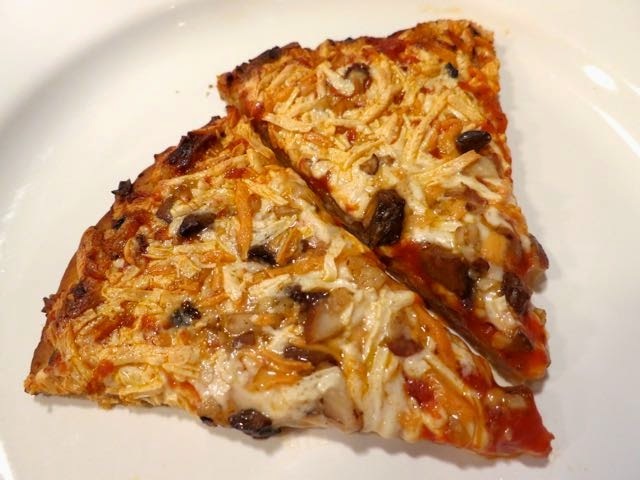 The Mushroom and Roasted Garlic pizza was the same gluten-free crust, but with both mozzarella and cheddar shreds plus shiitake and crimini mushrooms and roasted garlic. We were big fans of this one as well. Lastly, we tried the Cheeze Lover's pizza as well. A simple mix of mozzarella and cheddar shreds allows one to just enjoy the simplicity of the cheese or top it with their own stuff. I topped mine with black olives and red onion just for fun. So, yes, these taste like frozen pizzas. The crust is quite thin and not soft like a fresh pizza. But, when you are in a pinch, these really hit the spot. The vegetables and mushrooms are yummy and Daiya shreds always taste great. The only downside is that they are quite expensive as I've seen them sell for as low as $8.99 and as high as $10.99. For a frozen pizza, that's pretty pricey. But, it's the non-traditional ingredients that drive the price up. If you are planning to stay in and watch a movie and just contemplate life, a Daiya pizza might just be the perfect complement. You can find them in Whole Foods nationwide. Pizza, pizza! I just baked the Daiya Mushroom and Roasted garlic. This is the grossest attempt at a pizza I have ever eaten. The crust is tasteless cardboard. The sauce has no spices. I could not discern any garlic. The "cheese" was the best part, but not worth the effort to scrape it off. After 2 bites, the whole thing went in the trash. 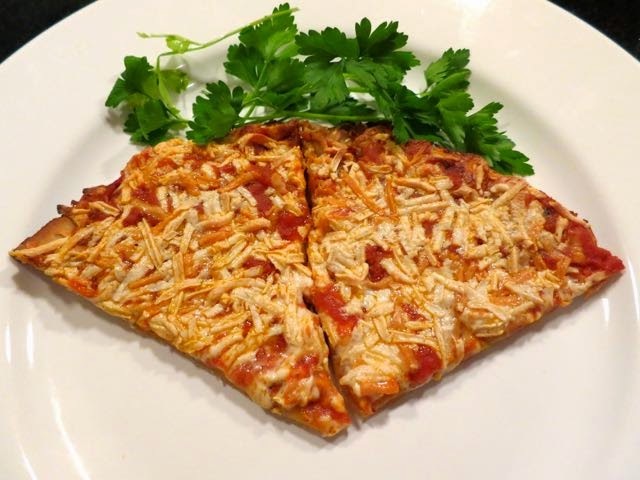 I enjoy the Daiya pizzas as well, and the fire roasted is also my favorite! I make the tempeh "sausage" from Post Punk Kitchen to sprinkle over it! Yum.